I hunt in Newfoundland and over the past few years, the area I hunt has more cows than bulls. This time of the year when a bull follows a cow he will not leave her tell the job is done. My question is what can one do to draw the bull away or in during this time? Yup, that's a tough one. If you know how to do an estrus whine, you may have some success... maybe! 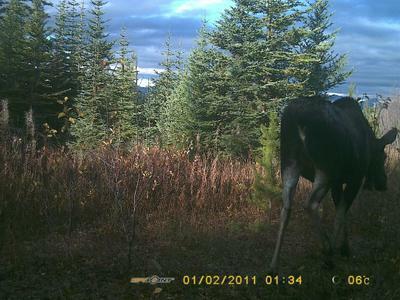 Another idea, if you can see the moose, is to use a cow moose decoy that you have set up. That might work. However, at least in my experience, you don't have much hope. If the cow hears another that is calling to her bull, she'll do all she can to lure him away. As I see it, the bull can see and smell a cow, even if he hears you and starts in your direction he's likely to return to the one he is with. One thing you do have going for you is, the bull will remember where he heard the other cow (you) and will return to look for her when he has bred the cow he is currently with.